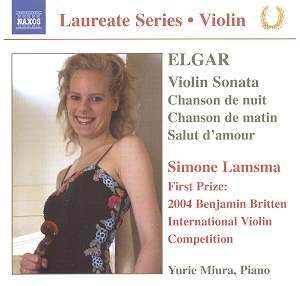 One can�t be certain of course that Simone Lamsma has listened to Albert Sammons�s classic 1935 recording of the Violin Sonata but I�d be surprised if she hasn�t. The contours are very similar and more to the point the expressive direction is very similar, unlike more recent performances, almost all of which go in for point making and drawn out drama to some degree or other. This then is a direct, immediate and powerful performance, even faster in the finale than Sammons, though a touch slower in the opening movement. I admit it�s the way I like the Sonata and everything I say should be construed in the light of my admiration and appreciation of her sure instincts as to architecture and internal contrastive devices. These were qualities Sammons always displayed and nowhere more so than in this sonata, the sequential writing of which is almost miraculously hidden in his masterful playing. However the Simone Lamsma-Yurie Miura duo makes a powerful showing. There�s a strong sense of engagement between instruments, with the piano part avidly purposeful and very much more assertive than is often the case. In the finale Miura really comes into her own, presenting a great amount of detail with a clarity that is sometimes obscured in other performances. She�s no wall-flower, ringingly declamatory and powerful, and drawing the ear, maybe not always to the advantage of balance. Others violinists have phrased more generously than Lamsma and there are times in the first movement when she cedes to Vengerov, Midori, Kennedy and McAslan � to name a prime quartet � in phrasal and tonal sensitivity. I�m not quite sure she fully controls the first movement passagework either which, for all her architectural acuity, does come across as a touch stolid. Still she�s right to take the slow movement at such a bracing tempo � it�s marked Romance not Adagio after all � and the eagerness she imparts to it is an antidote to more indulgent performers. And how well she deals with the finale�s reminiscence of earlier material � a real Sammons solution though ultimately lacking his artful preparation. This all-Elgar disc will remind one of Nigel Kennedy�s Chandos offering, one of his earliest recordings. It too presented the Sonata coupled with smaller pieces. His concertante take on the sonata is still highly impressive and I admire it, whilst preferring other solutions. McAslan�s disc has just been re-released, coupled with the Walton, slower than the Naxos duo but elegant. Vengerov�s coupling on Teldec is the Dvoř�k Concerto, unusual bracketing to say the least. Avoid Rostal (Testament), Little (GMN) and Oliveira (Artek), but consider Bean/Parkhouse on EMI Classics for Pleasure and coupled with Bean�s Concerto performance along with the other chamber works. If you want the Sammons it�s available from Pearl, coupled with the Concerto. It�s also available on Naxos in a dog�s dinner of a recital, coupled with the Mozart Sinfonia Concertante and some encore pieces. Wonderful playing, terrible programming. For a bargain-priced recital however this Naxos entrant has real merit. Strikingly alert and forward-moving the Lamsma-Miura duo brings the sonata alive in a way bigger figures often signally fail to achieve.